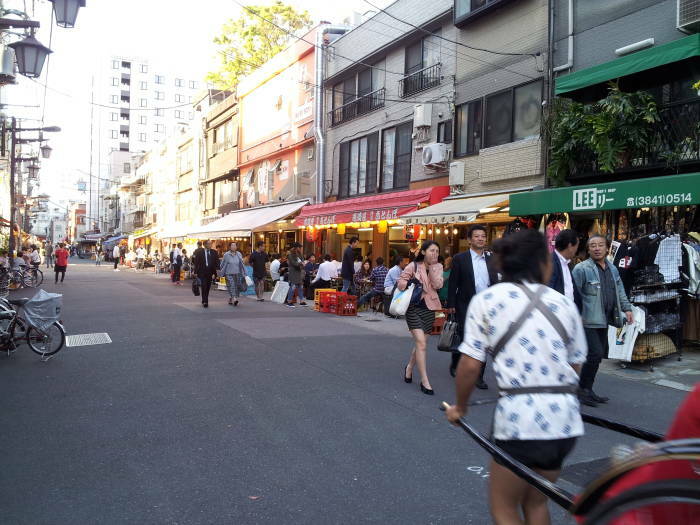 We're visiting the Asakusa district in Tōkyō. As I explained on the previous page, things so far have been pretty heavy going — history back to the megalithic era (as late as the 600s CE in Japan), details of Shintō and Buddhist belief and practice, fire-bombing raids of World War II, the guardian deity of dead children, and more. It's time to lighten up and wander the neighborhood! As I explained in the first page in this set, I flew into Haneda Airport and took the easy train ride to Asakusa Station. 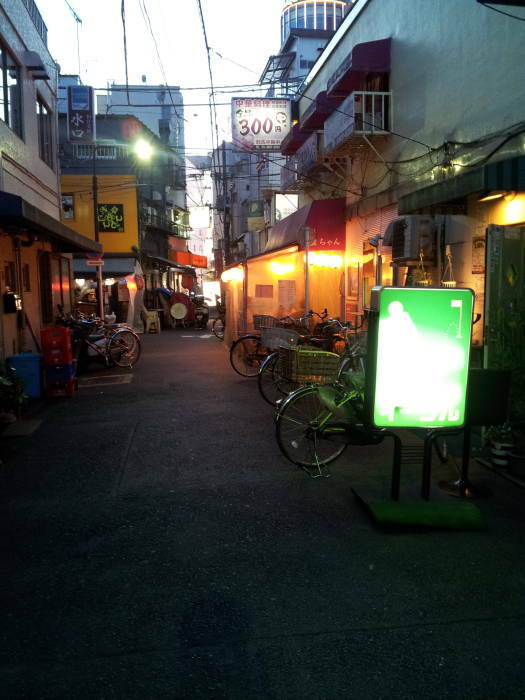 Then it was a fairly short walk to the Khaosan World Asakusa Ryokan & Hostel. For me that was a roughly 12-hour flight with a 12-hour time shift. Leave about noon local time, fly 12 hours, and land about noon local time. 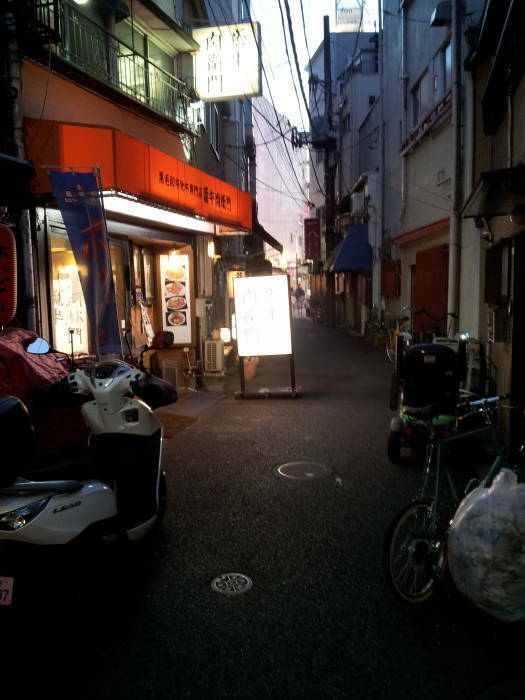 I managed to stay (mostly) awake until 2100 local time, visiting Hoppy Street that first night and coming back most of the following nights I was in Asakusa. 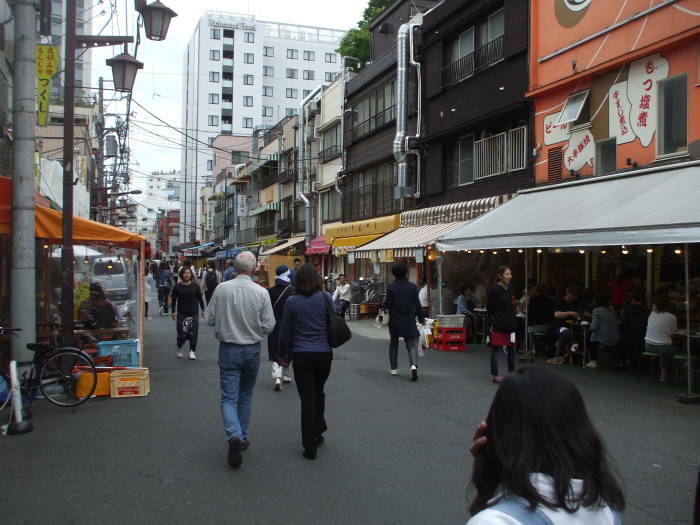 Hoppy Street is about 80 meters long, running down the west side of the Sensō-ji Buddhist temple complex and lined with traditional izakaya or small taverns. Things start rolling mid-day and continue well into the evening. As for the namesake beverage, I suppose Hoppy Street is named for the Hoppy drink. Or maybe it's the other way around. I'm not certain. Uncertainty is a big part of Hoppy Street. Hoppy in its pure form is a very-low-alcohol-content fermented malt beverage. Basically a "beer-flavored" beverage. It is then mixed in widely varying fractions with shō-chū. That's the product of fermenting rice, barley, sweet potatoes, buckwheat, or brown sugar (or possibly chestnut, sesame seeds, potatoes or carrots), and then distilling the result to somewhere between 25% and 45% alcohol by volume. One classic form of shō-chū would be sake or rice wine that is then distilled, analogous to grape-based wine distilled into brandy. Typical shō-chū is stronger than wine or sake, and weaker than whiskey or vodka. So, Hoppy might mean a nearly non-alcoholic beverage, or a slightly beer-flavored liquor, or anything in between. The local terminology uses "black" for more alcohol and a stronger taste, versus "white" for less alcohol and a milder taste. This is why you hear a wide range of stories about Hoppy experiences. 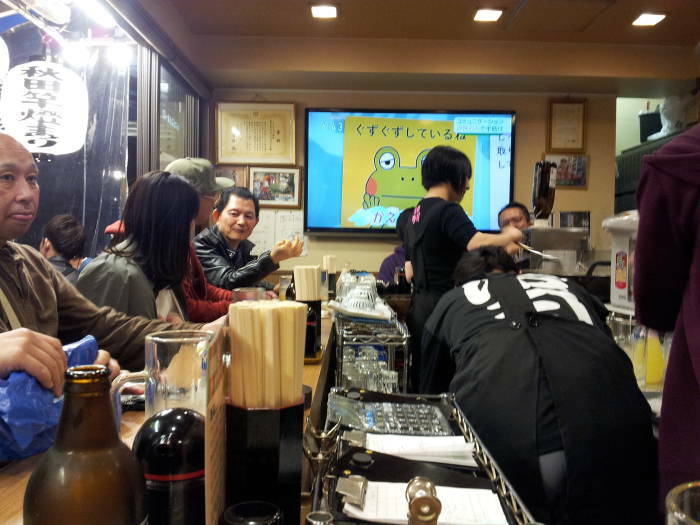 Below are a couple of pictures from the izakaya I wandered into my first night in Asakusa, and then returned to several more nights until my last night there. Friendly people, good food. 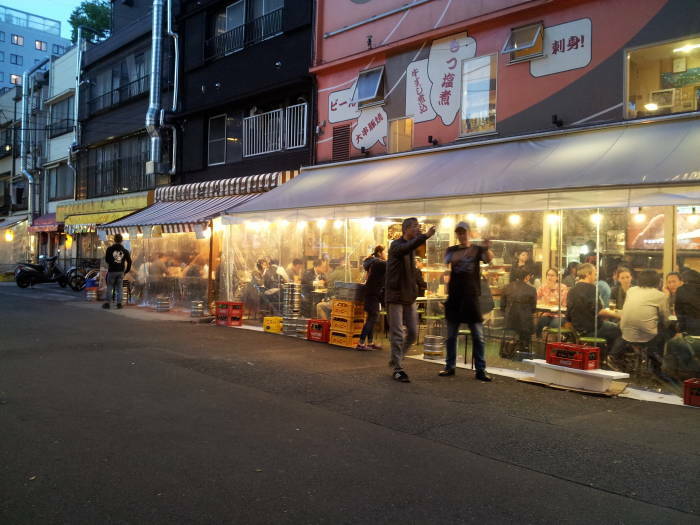 As a local explained to me in an izakaya one time, "Look, you don't want to drink without having something to eat. Because that would be, well, English." So yes, eat something! Yaki- generally indicates something that is grilled or fried. 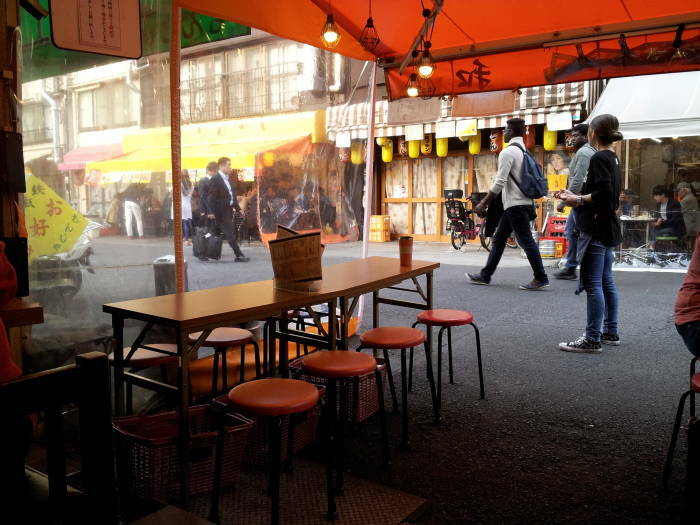 Yaki-tori is chicken grilled on a wooden skewer, yaku-udon is noodles fried with green onions. My experience is that pretty much all the places up and down Hoppy Street have an English menu or someone who can speak some English. 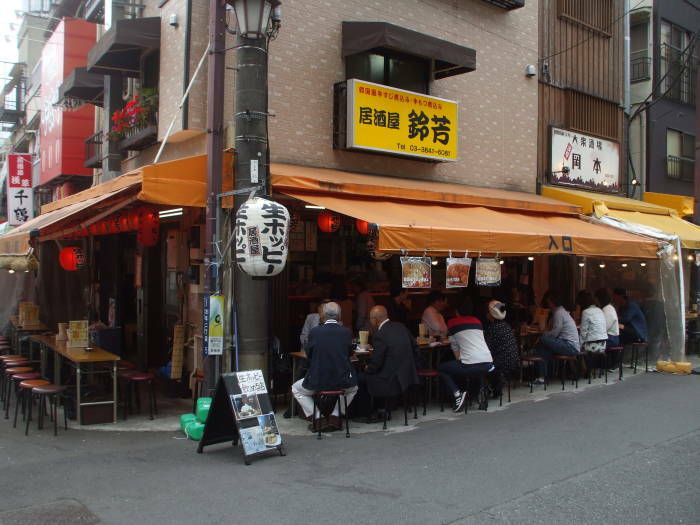 Some of them have signs saying "English Menu Available", and those typically also have signs detailing the minimum drink and food purchases. Avoid those places. Stick to places with nothing visible in romanji, let alone English. Unless, of course, you can sound out the Katakana and Hiragana scripts. In that case, for the advanced version, ignore the offered Romanji menu and point to what you want on the Japanese one, asking for やきとり and ビル, ya-ki-to-ri and bi-ru, or えだびめ and ビル, e-da-ma-me and bi-ru, priced about 75% what they are on the English Menu. But, seriously, go to the friendly places with no English in sight. 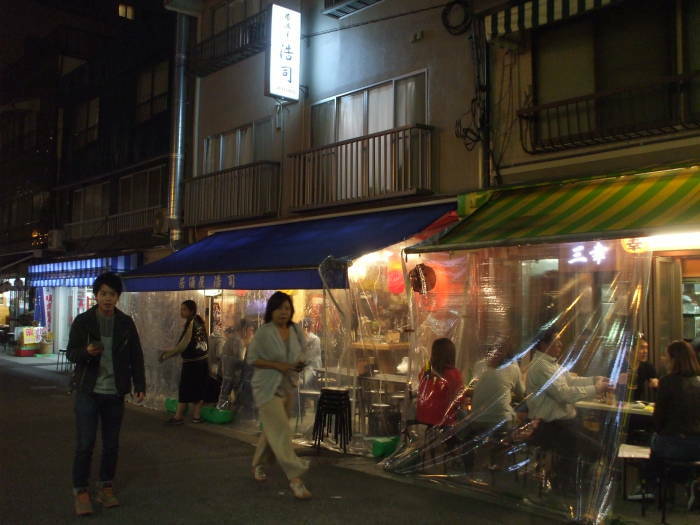 One evening toward the end of my time in Japan, I went into my usual Hoppy Street izakaya. There was a group of somewhat loud guys, a little boisterous, obviously all together, at the tables along the street. Inside, I was about the only person at the counter. The guy behind the counter was nervous. "Yakuza! ", he said. Really? Yakuza? Huh. I saw one had ring tattoos. I felt unthreatened. A bunch of hedge fund bros in Lower Manhattan on a Thursday night would be far louder and intrusive. Angry bearded midwestern American rednecks, probably armed and certainly belligerent, would be much more frightening. 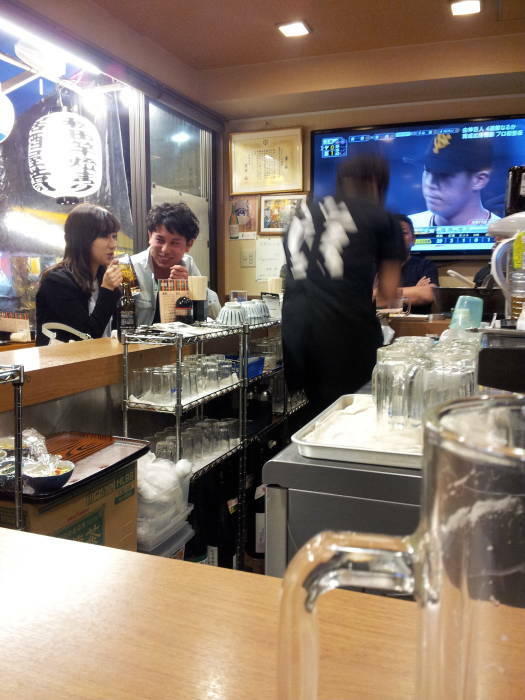 I stayed, had やきとり and ビル, watched the バスバル or ba-su-ba-ru, and chatted with the staff. Then I went to the lounge at the hostel where I heard people from a variety of countries using English to discuss the U.S. in the past tense.